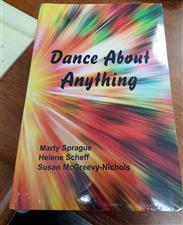 Authors: Sprague, Marty, Helene Scheff and Susan McGreevy-Nichols. Publisher: Human Kinetics (2006). This reference for K-12 classroom dance arts teachers is a supplemental text for methods courses on facilitating critical thinking skills via integrated projects for grades K-12. It helps teachers learn the creative process for developing movement and dance around a theme or academic subject matter.